I have a reference which I expect to appear as (van de Lavoir et al. 2006) but instead it appears as (van de Lavoir, Diamond et al. 2006). 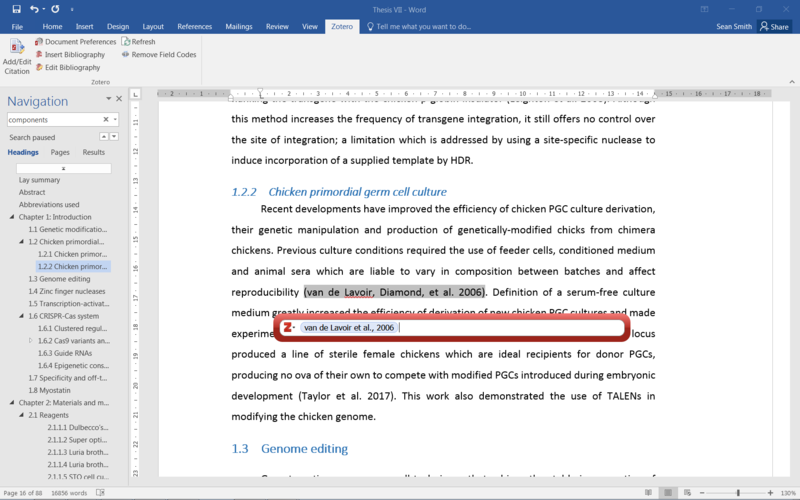 In the below screenshot you can see that it appears correctly in whatever-the-heck that red box is called and incorrectly in the text of my MS Word document. Diamond is the name of the second author and there are twelve authors in total. What style are you using? What is likely happening is that you have two citations that would be shortened to (van de Lavoir et al. 2006), and Zotero is disambiguating them by adding an extra name. This behavior is controlled by the style (e.g., some styles add names, others just use letters after the year). Hi, how about Emerald Harvard style? I'm having a same issue, and I don't know what is correct for Emerald Harvard style. I am just used to alphabet letter after the year but not sure, hence seeking your advice! MANY THANKS! We don't know what's correct in Emerald Harvard -- we presume the current version, i.e. adding a name, is correct, but it's very much possible we're mistaken, so if you find something to the contrary in a published example (it's unlikely to be covered in the style guide), we're happy to change it.